Wayne County announced Sunday it has reached a $4.65-million tentative deal to sell the 511 Woodward Building in downtown Detroit to Birmingham’s Elia Group. The deal is pending approval by the Wayne County Commission. “We plan on investing more than $9 million in the building, which includes re-imagining the entire façade of the building to make it more modern, approachable, exciting, and unique along the Woodward Avenue streetscape,” says Zaid Elia, president and CEO of the Elia Group. 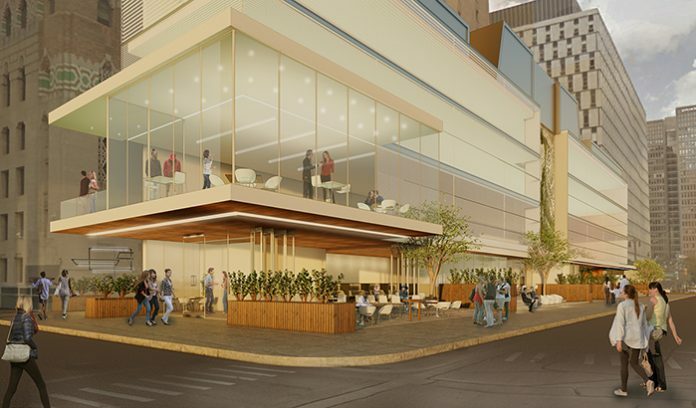 The 29,968-square-foot building would include a new location for the Downtown Detroit Partnership (DDP), providing it a long-desired street-front locale. The nonprofit development advocacy and operations organization is currently located on the third floor of One Campus Martius (formerly Compuware Building). Current plans for the development include a first-floor restaurant and the Wayne County/DDP Welcome Center. The three floors above will be office space, including DDP’s offices. The building was completed in 1972 and is directly east of the Guardian Building. It is the southern-most stop on the QLINE. DDP works to strengthen and support downtown Detroit through strategic initiatives and programs. It convenes business, philanthropic, and government partners to create an urban core for Detroit. The Elia Group currently owns and operates The Ford Building, Parc Restaurant, The Fountain Detroit, and Anchor Bar, all in Detroit, as well as 220 Merrill and Rose Room at 220 in downtown Birmingham, and DoubleTree by Hilton Bloomfield Hills Detroit, which includes Zalmans and The Duke.